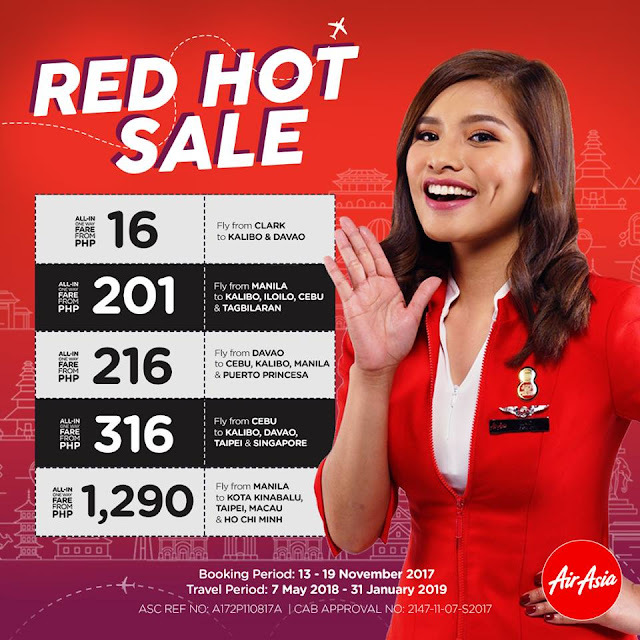 Piso Fare Promos: It's #REDHotSale Alert thru Air Asia PH! This is one of the earliest Christmas treats from the airlines that you can avail. Though you might be expecting much on the next Piso Fare Promo update, however, there is none yet! But we have a better bargain on plane fares. Actually, the are really very affordable! Talk about the cheapest at Php 16! How is that? For sure it is a domestic flight from Clark but that is something you can definitely avail. And it is not just the only promo, four more cheaper plane tickets are up for grabs! These awesome deals will definitely make you oogle. So if I were you now, grab this opportunity of cheap Air Asia plane fares. You might be stunned of the travel period! As late at January 31, 2019! Talk about the time value of money when you purchase the tickets now in year 2017 for a travel plan in the next 2 years! That is simply amazing! It's been showcased in this latest promo a fair fare to the wonderful beaches in the world, which is Boracay. When your flight is bound to Kalibo, you are now hours away by bus to this famous and beautiful island in the Panay region. Domestic destinations are not just on promo, also routes on an international in nature are still up for grabs at a cheaper fare more like traveling to a local flight. With the said low fares, you can now travel to Taipei, Singapore, Macau and Vietnam which are all VISA-Free! So take advantage of this opportunity, now! Unable to book the said promo flights. Can we just get the promo code. There is no Direct flights from Mumbai to Davao.. and Manila. If this flights​ are started.. the passengers travelling from Mumbai to Davao or Manila can save hours of time waiting at the one or two stops.